The Bandit robot is a robotic personal trainer developed by students at USC's Viterbi School of Engineering. Bandit will first model exercises for you. Bandit is able to watch your movements and then mimic them, hopefully encouraging to greater effort. Bandit is used in a USC study "Robot Motivator: Towards Adaptive Health Games for Productive Long-Term Interaction". Half of the participants will have a live, in person robot; the other half will watch the robot on video. Manga enthusiasts have seen this idea before. In the 2001 series Chobits, Sumomo is a "mobile persocom", essentially an animated laptop computer. 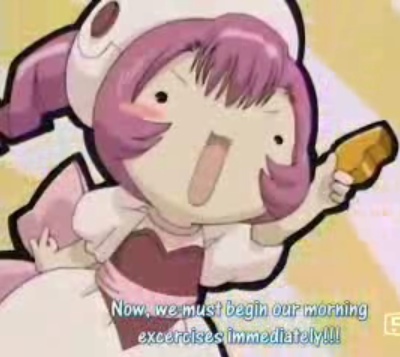 She leads Hideki in wakeup exercises every morning and dances in standby mode.